•	1 KG of hammered lamb for kubba. •	1 tablespoon of half-hot pepper paste. •	1 small grated onion. •	A teaspoon of red pepper. •	2-3 leaves of finely minced basil grapes. •	A few of finely minced marjoram grapes. •	2 1/2 of fine white grit. •	Olive oil for serving. •	Peeled and cut into quarters white onion. •	Add the grated onion, salt, pepper paste, basil and marjoram. •	Scrub kebbeh within wet fingers until it becomes a mellow and sticky mass. •	Stretch kebbeh in an oval or circular plate using hands, and stretch the surface of it using wet fingers. 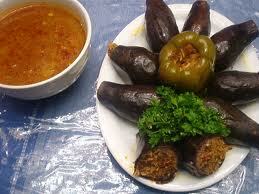 •	Decorate kebbeh with pine and onion and serve it with olive oil.